Papoutsi Athanasia, a Postdoctoral researcher in the Computational Biology Lab (Poirazi Lab), Institute of Molecular Biology and Biotechnology (IMBB) at the Foundation for Research and Technology-Hellas (FORTH), was recently awarded the prestigious NARSAD Young Investigator Award. 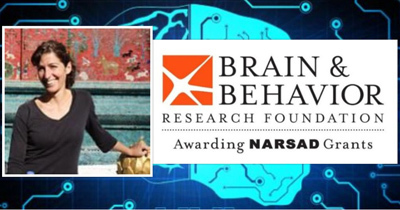 NARSAD Young Investigator grants, valued at more than $13.8 million, support the work of 200 early-career scientists from around the world with innovative ideas for ground-breaking neurobiological research seeking to identify causes, improve treatments and develop prevention strategies for psychiatric disorders. The research activity of Dr. Papoutsi will focus on dysfunctional decision-making that leads to failure to adapt in a changing environment, constraining the independence and quality of life of patients with related diseases. Under the mentorship of well-renowned labs in Crete (Poirazi’s lab, IMBB/FORTH and Sidiropoulou’s lab, University of Crete &IMBB/FORTH) and the guidance of the collaborator Prof. Stelios Smirnakis (Harvard Medical School), she will investigate how modificationsof spines (the loci of communication between cells) in single neurons are associated with inflexible behavior. She will study neurons in the prefrontal cortex, the brain region that is associated with flexible behavior via the use of experimental and computational approaches. The combination of multidisciplinary approaches enables a detailed understanding of the brain function at the cellular level and its dysfunction in terms of dynamical processes occurring at the spine level. 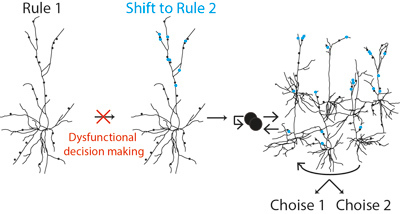 Showing that behavioral inflexibility is imprinted on the subcellular machinery in cortical pyramidal neurons, may set the foundations for revolutionizing our current view of neural processing in the brain.